A beautiful artist's concept of a Ranger spacecraft photographing the Moon before impact. 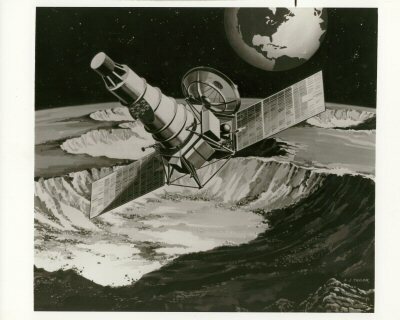 Ranger was originally to be a program of five unmanned lunar crasher spacecraft, intended to quickly obtain information on the lunar surface. 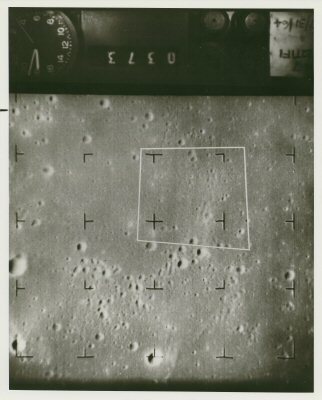 The scientific objective would be to acquire and transmit a number of images of the lunar surface prior to impact, and to obtain data from a survivable package incorporating a lunar seismometer. The resulting spacecraft was much too ambitious for its period. 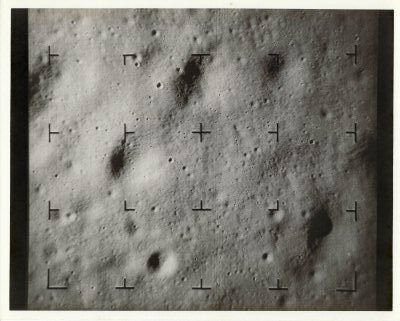 After five consecutive failures, a simpler, picture-return-only spacecraft made three successful flights, returning the first close-up pictures of the lunar surface years behind schedule. These were Ranger B, C and D. Upon achieving orbit they were renamed Ranger's 7, 8 and 9 respectfully. Ranger 9 was the last spacecraft / mission in the Ranger program. 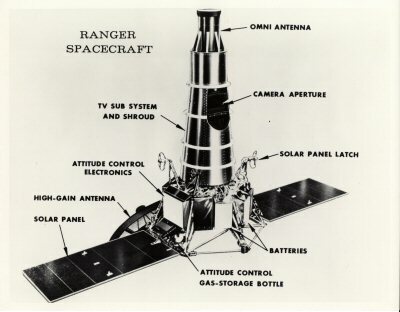 A fine drawing of the Ranger Spacecraft noting its primary features. Originally made for the Ranger-B mission in 1964. 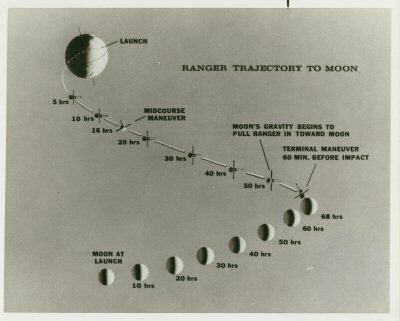 Conception of the Ranger's Journey to the Moon. Originally made for the Ranger-B mission in 1964. 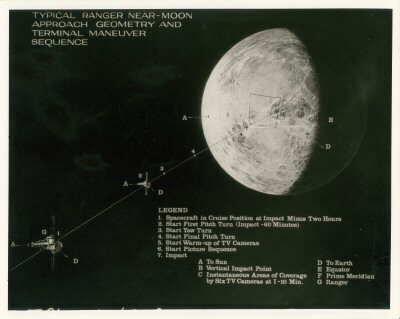 Conception of the Ranger's Trajectory to the Moon. 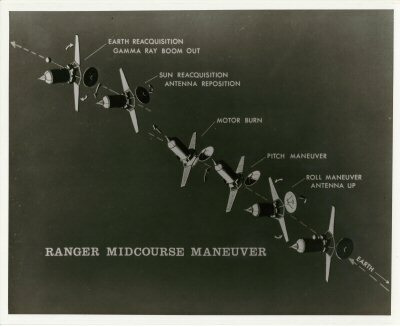 Artist's concept showing a Ranger executing a typical trajectory correction command sent to it from JPL Goldstone Tracking Station. 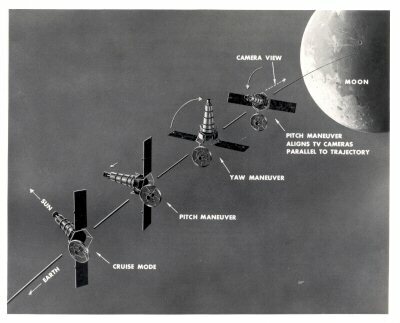 Artist's concept of a typical Ranger Moon Approach Geometry and Terminal Manoeuvre Sequence. 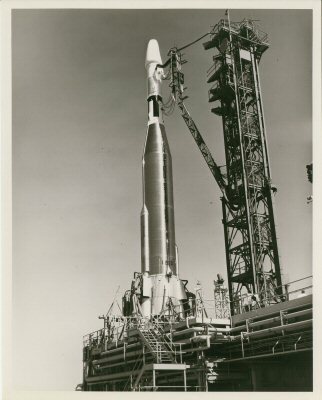 A fine view of the Atlas Agena B configuration with the Ranger 1 as its payload on the launch pad at Launch Complex 12 at the Cape. A beautiful night launch view at Launch Complex 12 at the Cape. The lunar probe failed to leave Earth orbit. 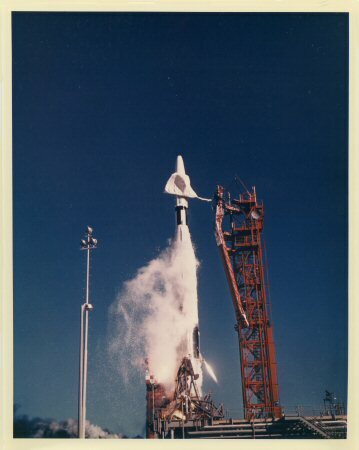 Ranger 1, a test version of the spacecraft which would attempt an unmanned crash landing on the moon. The 306 kg spacecraft did not attain the scheduled extremely elongated orbit because of the misfiring of the Agena B rocket. Although the spacecraft systems were tested successfully, only part of the eight project experiments could be carried out. 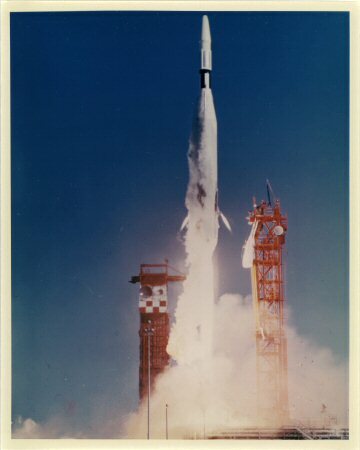 Ranger 1 re-entered on August 29 after 111 orbits. 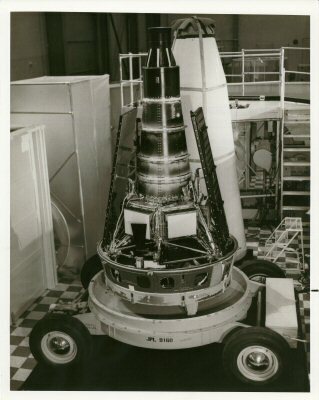 Ranger 1's primary mission was to test the performance of those functions and parts that are necessary for carrying out subsequent lunar and planetary missions using essentially the same spacecraft design. 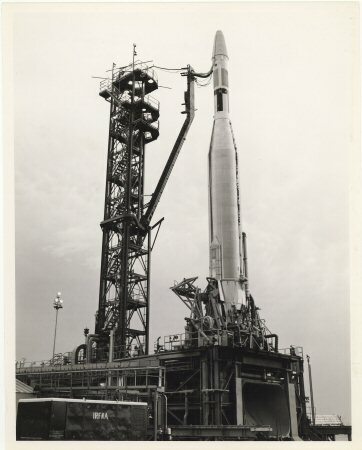 Ranger III spacecraft, positioned atop its Atlas Launch Vehicle, undergoes final critical systems tests prior to launch from the Cape. 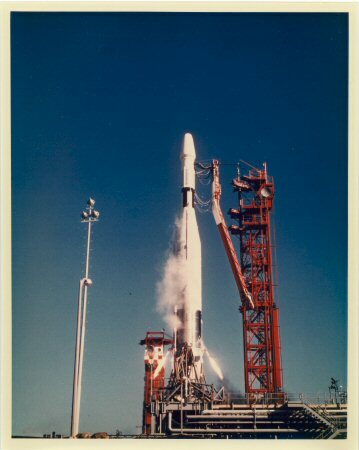 Ranger III was successfully launched 26 January 1962 at 3:30 p.m. EST from Launch Complex 12. 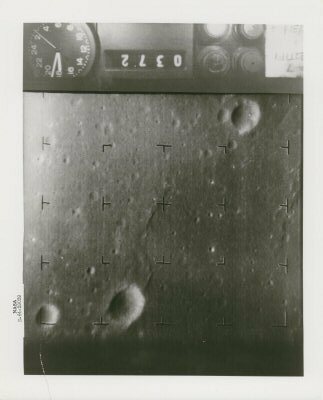 Primary objective of the Ranger III was to photograph the lunar surface, make a hard landing and then relay information on surface characteristics as a preliminary to manned lunar landings. Ranger III missed the moon by 36,874 km and went into solar orbit. A malfunction in the booster guidance system resulted in excessive spacecraft speed. Reversed command signals caused the telemetry antenna to lose earth acquisition, and mid-course correction was not possible. Some useful data were obtained from the flight. Of four scientific experiments only one was partially completed: gamma-ray readings of the lunar surface. 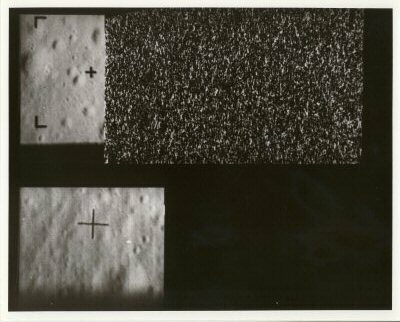 Attempts to relay television pictures of the moon and to bounce radar signals off the moon at close range were unsuccessful. 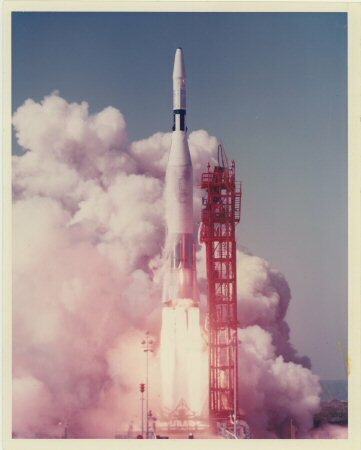 Ranger III was launched 26 January 1962 at 3:30 p.m. EST from Launch Complex 12 onboard the Atlas Agena B 121D (AA3) / Agena B 6003 launch vehicle. This very fine vintage NASA colour glossy photograph is in mint condition and printed on heavy A Kodak Paper. 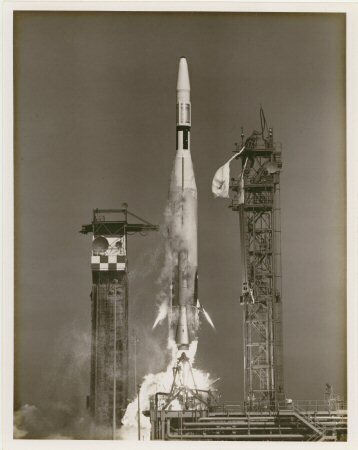 Ranger III spacecraft, positioned atop its Atlas Launch Vehicle, lifts off from Launch Complex 12 at the Cape. 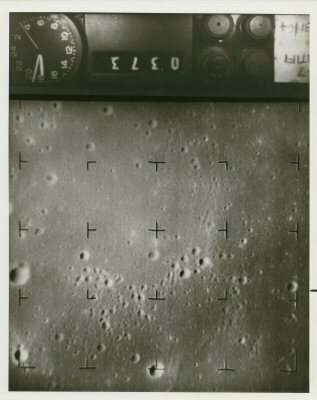 Its primary objective was to photograph the lunar surface, make a hard landing and then relay information on surface characteristics as a preliminary to manned lunar landings. 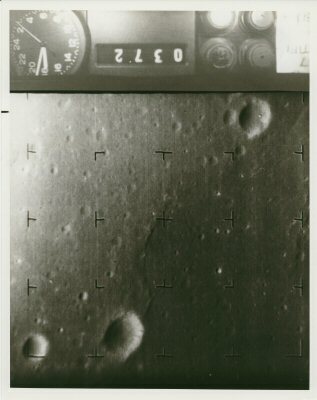 Ranger III missed the moon by 36,874 km and went into solar orbit. A malfunction in the booster guidance system resulted in excessive spacecraft speed. Reversed command signals caused the telemetry antenna to lose earth acquisition, and mid-course correction was not possible. Some useful data were obtained from the flight. 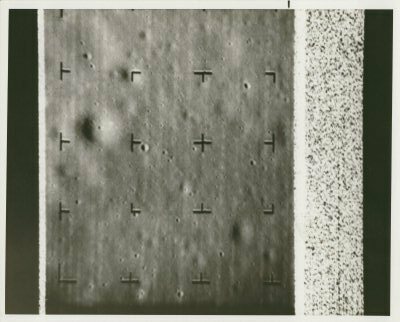 Of four scientific experiments only one was partially completed: gamma-ray readings of the lunar surface. 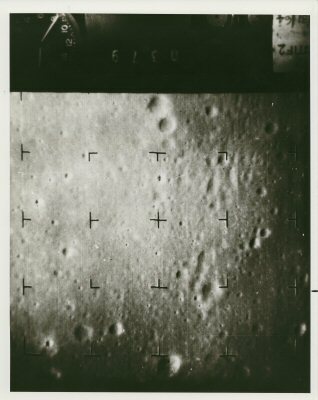 Attempts to relay television pictures of the moon and to bounce radar signals off the moon at close range were unsuccessful. 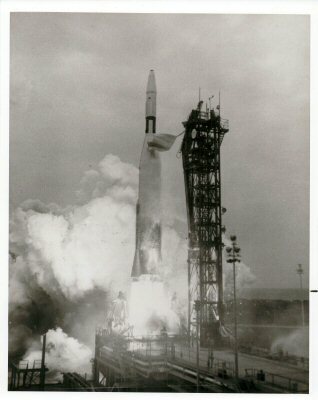 Ranger III was successfully launched 26 January 1962 at 3:30 p.m. EST from Launch Complex 12 onboard its Atlas LV- 3A / Agena B launch vehicle. This very fine vintage NASA colour glossy photograph is in very good condition, near mint and printed on heavy A Kodak Paper. 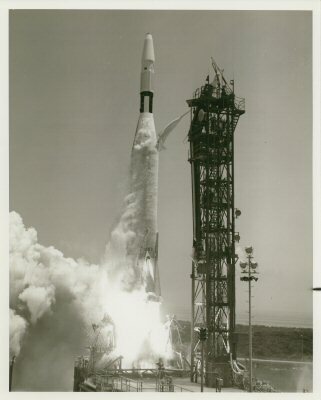 Ranger IV was launched by an Atlas-Agena B booster from the Atlantic Missile Range, attained a parking orbit, and was fired into the proper lunar trajectory by the restart of the Agena B engine. Failure of a timer in the spacecraft payload caused loss of both internal and ground control over the vehicle. The Goldstone Tracking Station maintained contact with the spacecraft until it passed behind the left edge of the moon on April 26. It impacted at a speed of 9,617 km per hour, the first American spacecraft to land on the lunar surface. 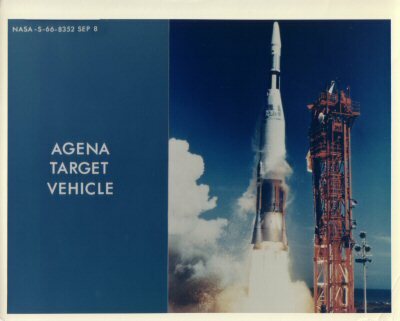 The Agena B second stage passed to the right of the moon and later went into orbit around the sun. Lunar photography objectives were not achieved.. This very fine vintage NASA glossy photograph is in mint condition. 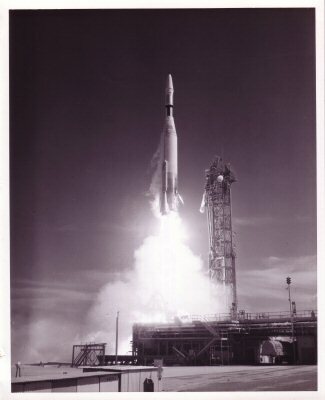 Ranger IV was launched 23 April 1962 from Launch Complex 12 onboard the Atlas Agena B 133D (AA4) / Agena B 6004. This very fine vintage NASA colour glossy photograph is in near mint condition and printed on heavy A Kodak Paper. This very fine vintage colour NASA lithograph is in near mint condition. 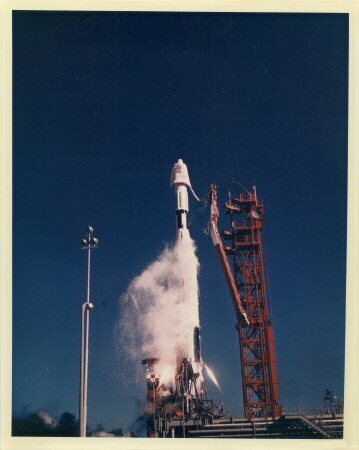 Launched from the Cape on 28 July 1964 onboard a Atlas LV-3A Agena B Launch Vehicle. 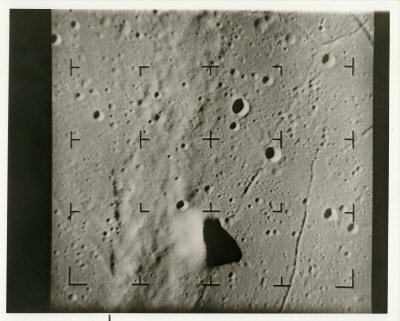 This was the first successful Ranger; it returned 4,308 photos before lunar impact. The Atlas- Agena B inserted the Agena and Ranger into a 192 km altitude Earth parking orbit. Half an hour after launch a second burn of the Agena engine injected the spacecraft into a lunar intercept trajectory. After separation from the Agena, the solar panels were deployed, attitude control activated, and spacecraft transmissions switched from the omni-antenna to the high-gain antenna. The next day the planned mid-course manoeuvre was successfully initiated at 10:27 GMT. 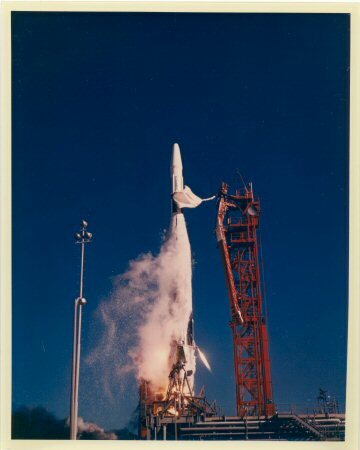 The only anomaly during flight was a brief loss of two-way lock on the spacecraft by the DSIF tracking station at Cape Kennedy following launch. Ranger 7 reached the Moon on 31 July. The F-channel began its one minute warm up 18 minutes before impact. The first image was taken at 13:08:45 GMT at an altitude of 2110 km. Transmission of 4,308 photographs of excellent quality occurred over the final 17 minutes of flight. The final image taken before impact had a resolution of 0.5 meters. The spacecraft encountered the lunar surface in direct motion along a hyperbolic trajectory, with an incoming asymptotic direction at an angle of -5.57 degrees from the lunar equator. The orbit plane was inclined 26.84 degrees to the lunar equator. After 68.6 hours of flight, Ranger 7 impacted in an area between Mare Nubium and Oceanus Procellarum (subsequently named Mare Cognitum) at approximately 10.35 S latitude, 339.42 E longitude. Impact occurred at 13:25:48.82 GMT at a velocity of 2.62 km/s. A very clear view of the Ranger B spacecraft during final Pre-flight check outs in Hangar A&M at the Cape. This very fine vintage glossy NASA photograph is in very good condition, near mint. 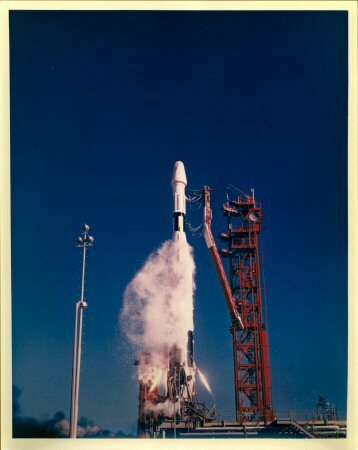 Ranger B (7) was launched from the Cape's Launch Complex 12 at 12:50 EDT on 28 July 1964 onboard a Atlas LV-3A Agena B Launch Vehicle. 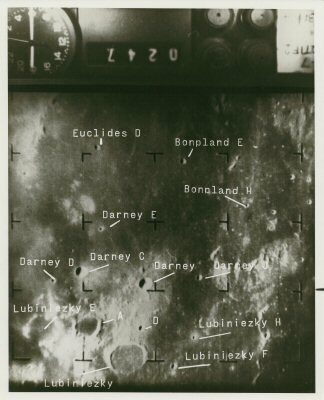 Oval shaped area shows Sea of Clouds region on the Moon in which Ranger VII is expected to impact Friday morning 31 July 1964. Latest trajectory data indicated the camera-carrying Ranger VII will impact within about 15 miles of the aiming point. 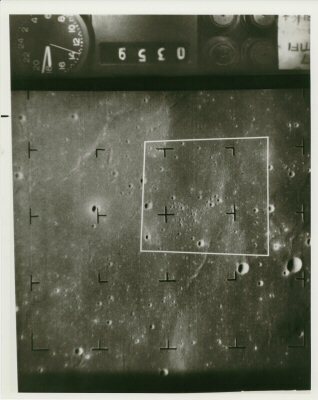 The below photograph taken by Ranger VII spacecraft prior to its impact on the Moon at 6:25 a.m. PDT on 31 July 1964 should be viewed with the clock in the upper left-hand corner and North is at the top of the picture. The clock, frame numbers and four buttons across the top of the photo are related to the recording of the films at the Goldstone Station of the Deep Space Network. 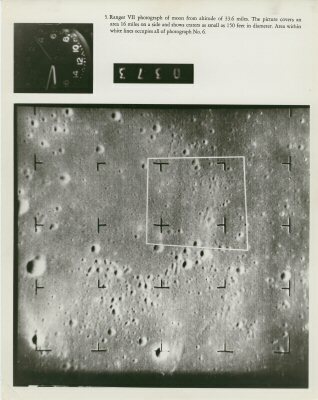 The black markings on the photograph are used to provide scale measurements. 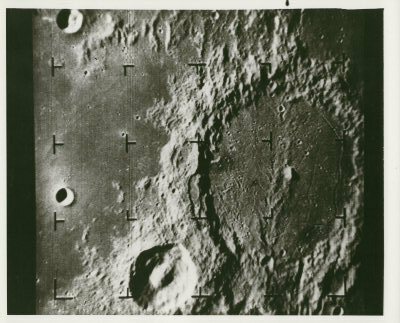 This is one of 4,316 lunar photographs returned by NASA's Ranger 7 spacecraft, which impacted on the lunar surface at 9:25 a.m. EDT on 31 July 1964. Frame No. 0247 Camera F-a at an altitude of 480 miles. The white square indicated the area shown in Frame 0317 - listed below at 235 miles out. 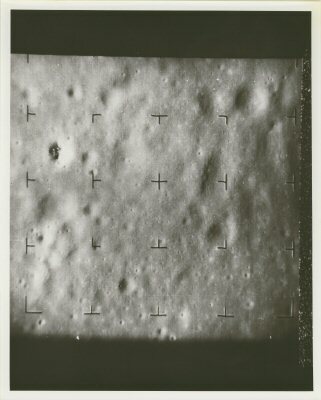 NASA identified the craters in this frame and noted them on this fine photograph. Frame No. 0248 Camera F-a at an altitude of 470 miles. Seen is an area about 78 miles on a side. The smallest craters shown are about 800-feet in diameter. The large crater in the upper right-hand corner is Guericke. Frame 0147 taken at an altitude of 375 miles slant range at 9:21:25.50 EDT. This very fine vintage glossy NASA photograph is in very good condition. 2 Minutes 46 Seconds Before Impact. This area was indicated by the white box in Frame 0247 NASA No. 64-RangerB-34 - shown above at 480 miles out. This photo shows an area about 113 miles on a side. The smallest craters seen are about 1,000 feet in diameter. The white square indicated the area shown in Frame 0359 - listed below at 85 miles out. This Frame (0359) was outlined in white in Frame 0137 above at 235 miles out. This picture covers an area 48 miles on a side and shows craters as small as 500 feet in diameter. The central area shows a cluster of secondary craters in part of an outlying ray of the crater Copernicus. This cluster is shown with greater resolution in Frame 0373 - shown below. The white square in this photo is the area shown in Frame 0373 below. This picture shows an area 48 miles on a side and defines craters as small as 500 feet in diameter. The largest craters, with prominent shadows, are primary craters of approximately conical shape. The Cluster of secondary craters lies in part of an outlying ray of the crater Copernicus. This Frame (0373) was outlined in white in Frame 0359 - NASA No. 64-Ranger-37 above at 85 miles out. This picture shows an area 16 miles on a side with craters as small as 150 feet in diameter. Central area is occupied by an outlying ray of the crater Copernicus containing numerous secondary craters. The white square in this photo is the area shown in Frame 0379 below. 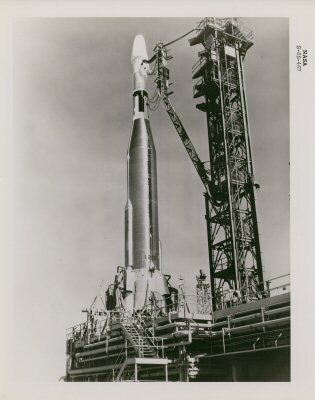 This NASA version has text at the top of the photo giving altitude and area covered details. 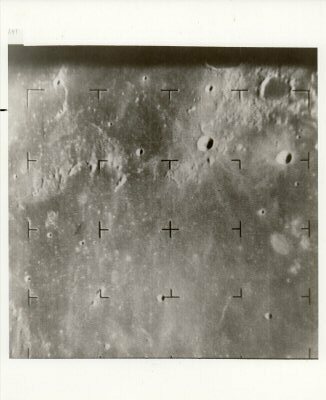 This is one of 4,316 lunar photographs returned by NASA's Ranger 7 spacecraft, which impacted on the lunar surface at 9:25 a.m. EDT on 31 July 1964 and was taken at an altitude of 34 miles and covers a area of 16 miles. This picture covers an area 4.5 miles square with craters down to 50 feet in diameter. Many have steep sides and others have shallow sides. An interesting feature is the ridge emanating from a prominent crater and the radial structure on the slope of the largest crater shown. 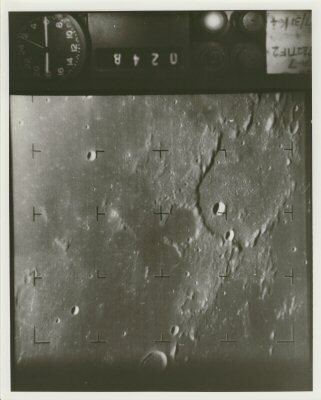 Photograph taken by Ranger VII spacecraft prior to its impact on the Moon at 6:25 a.m. PDT on 31 July 1964. Viewed with the clock in the upper left-hand corner, North is at the top of the picture. This was taken at an altitude of 25 miles. This very fine vintage glossy NASA photograph is in good to very good condition. This Frame (0379) was outlined in white in Frame 0373 - NASA No. 64-Ranger-38 above at 34 miles out. This picture shows an area 4 miles on a side with craters as small as 45 feet in diameter. The white square in this photo is the area shown in Frame 0381 (below), the last photo taken before impact by the Full-Scan (F-a) camera. 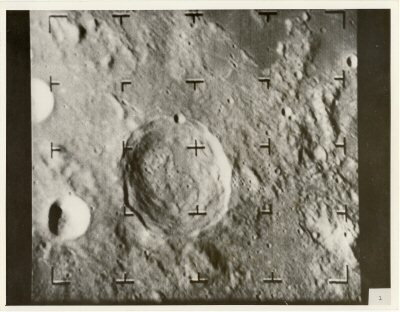 The photo shows a region 2.7 miles square with craters of diameters down to 25 feet. Large craters on the left side of the picture show characteristic rounded shoulders of secondary craters at this resolution. This Frame (0381) was outlined in white in Frame 0379 - NASA No. 64-Ranger-39 above at 12 miles out. Because this was the last picture taken by Ranger's F-a (Full-Scan) camera before impact, no data block appears but this is Frame 0381. This picture was taken about 2.3 seconds before impact. It shows an area about one-and-two-thirds miles on a side with triple the resolution as the area outlined in white in Frame 0379. The smallest craters shown are approximately 30 feet in diameter and 10 feet deep. 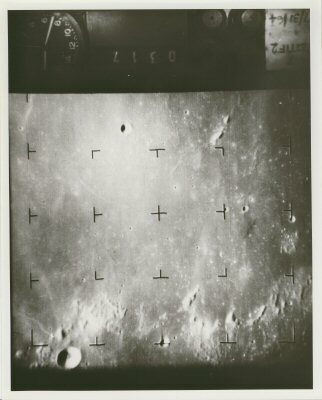 The top partial picture was the last taken by the P-3 camera before Ranger VII crashed onto the Moon. The spacecraft was destroyed while transmitting resulting in the receiver noise pattern. 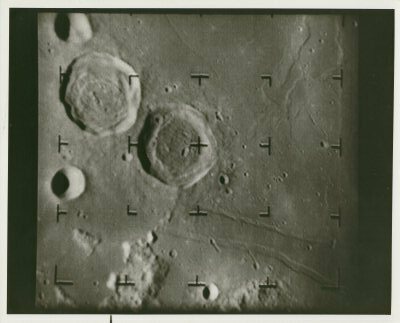 The picture was taken 1,000 feet above the lunar surface and is of an area about 100 feet by 60 feet. The smallest craters are about three feet in diameter and one foot in depth. The lower complete picture, showing an area about 100 feet on a side, was taken by the P-1 partial scan camera at an altitude of about 3,000 feet. 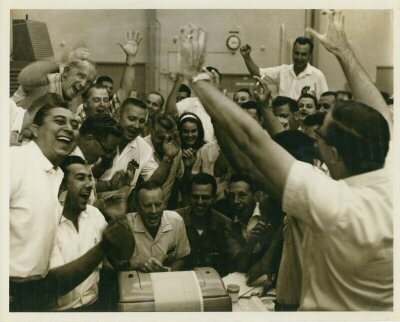 Cheer's of joy at JPL just moments after Ranger 7 smashed into the Moon. Finally a successful Ranger mission. This very fine vintage glossy NASA photograph is in good condition. 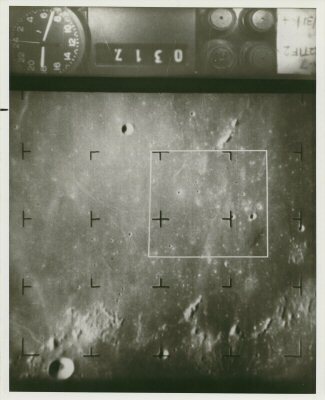 Ranger 8 returned 7137 photos before lunar impact. The Atlas- Agena B booster injected the Agena and Ranger 8 into an Earth parking orbit at 185 km altitude 7 minutes after launch. Fourteen minutes later a 90 second burn of the Agena put the spacecraft into lunar transfer trajectory, and several minutes later the Ranger and Agena separated. The Ranger solar panels were deployed, attitude control activated, and spacecraft transmissions switched from the omni-directional antenna to the high-gain antenna by 21:30 GMT. 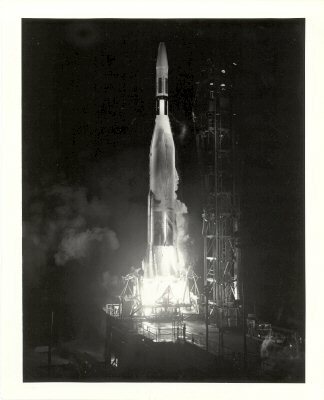 On 18 February at a distance of 160,000 km from Earth the planned mid-course manoeuvre took place, involving reorientation and a 59 second rocket burn. During the 27 minute manoeuvre, spacecraft transmitter power dropped severely, so that lock was lost on all telemetry channels. This continued intermittently until the rocket burn, at which time power returned to normal. The telemetry dropout had no serious effects on the mission. 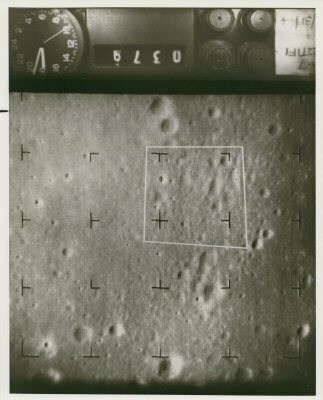 A planned terminal sequence to point the cameras more in the direction of flight just before reaching the Moon was cancelled to allow the cameras to cover a greater area of the Moon's surface. 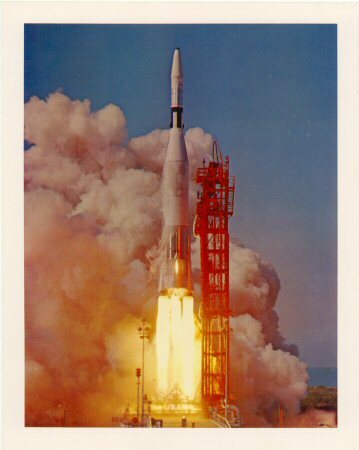 Ranger 8 reached the Moon on 20 February 1965. The first image was taken at 9:34:32 GMT at an altitude of 2510 km. Transmission of 7,137 photographs of good quality occurred over the final 23 minutes of flight. The final image taken before impact has a resolution of 1.5 meters. The spacecraft encountered the lunar surface in a direct hyperbolic trajectory, with incoming asymptotic direction at an angle of -13.6 degrees from the lunar equator. The orbit plane was inclined 16.5 degrees to the lunar equator. 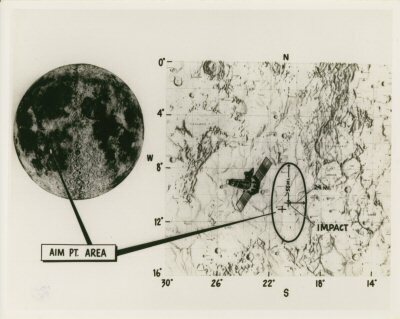 After 64.9 hours of flight, impact occurred at 09:57:36.756 GMT on 20 February 1965 in Mare Tranquillitatis at approximately 2.67 degrees N, 24.65 degrees E. Impact velocity was slightly less than 2.68 km/s. 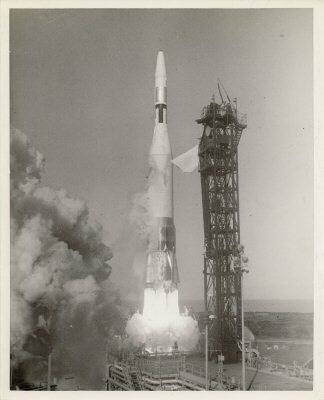 The Atlas LV3 Agena B lifts off from Launch Complex 12 at the Cape at 12:07 p.m. with the Ranger-C spacecraft onboard. If successful it will be named Ranger-8 after being placed in Earth orbit. This very fine vintage NASA colour glossy photograph is in very good condition and printed on A Kodak Paper. The Atlas 196D and Agena B 6006 boosters performed nominally, injecting the Agena and Ranger 8 into an Earth parking orbit at 185 km altitude 7 minutes after launch. Fourteen minutes later a 90 second burn of the Agena put the spacecraft into lunar transfer trajectory, and several minutes later the Ranger and Agena separated. This very fine vintage NASA presentation colour glossy photograph is in near mint condition and printed on A Kodak Paper. 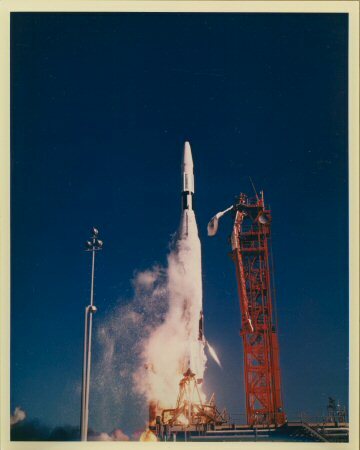 The Atlas LV3 Agena B lifts off from Launch Complex 12 at the Cape with the Ranager-C spacecraft onboard. If successful it will be named Ranger-8. 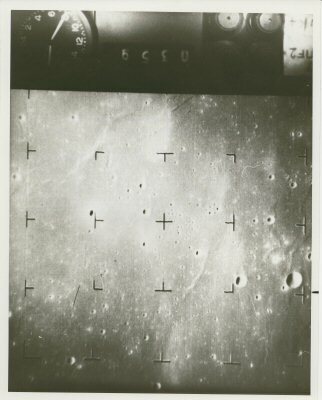 Television picture taken by Ranger VIII prior to impact on 20 February 1965 at 1:57 a.m. PST. North is at the top when the shadows appear to the left of the craters. This was taken 2 minutes 15 seconds before impact and the spacecraft is 151 miles above the Moon. Shown is the southwest corner of the Sea of Tranquillity with the large flat bottomed craters Sabine and Ritter with two rilles paralleling at the bottom of the photo. North is at the top when the shadows appear to the left of the craters. This was taken 2.09 seconds before impact and the spacecraft is 12,000 feet above the Moon. Ranger 9, last of the series, returned 5814 images before lunar impact. 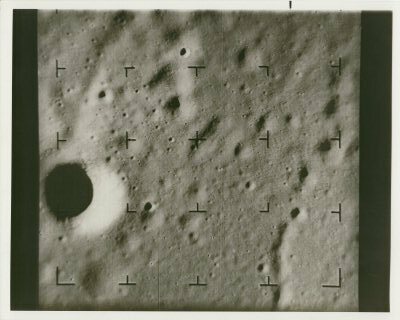 The target was Alphonsus, a large crater about 12 degrees south of the lunar equator. The probe was timed to arrive when lighting conditions would be at their best. The Atlas- Agena B booster injected the Agena and Ranger 9 into an Earth parking orbit at 185 km altitude. A 90 second Agena 2nd burn put the spacecraft into lunar transfer trajectory. This was followed by the separation of the Agena and Ranger. The initial trajectory was highly accurate; uncorrected, the craft would have landed only 650 km north of Alphonsus. 70 minutes after launch the command was given to deploy solar panels, activate attitude control, and switch from the omni-directional antenna to the high-gain antenna. The accuracy of the initial trajectory enabled delay of the planned mid-course correction from 22 March to 23 March when the manoeuvre was initiated at 12:03 GMT. After orientation, a 31 second rocket burn at 12:30 GMT, and reorientation, the manoeuvre was completed at 13:30 GMT. 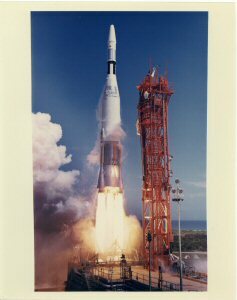 Ranger 9 reached the Moon on 24 March 1965. At 13:31 GMT. 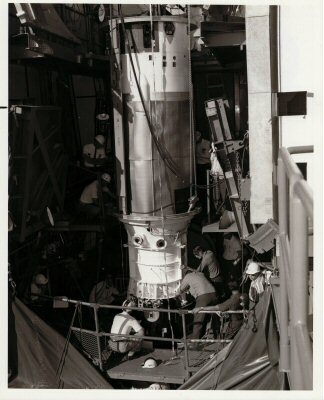 The Agena, second stage of the Atlas launch vehicle for the Ranger spacecraft is being erected at Launch Complex-12 at the Cape. This will be the ninth Ranger and was designated Ranger D. If successfully launched it will be named Ranger 9. 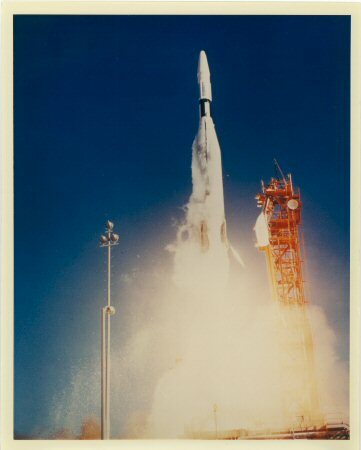 Ranger IX, final Ranger in NASA's lunar exploratory program lifts off from LC-12 at the Cape atop an Atlas-Agena launch vehicle at 4:37 p.m. 21 March 1965. 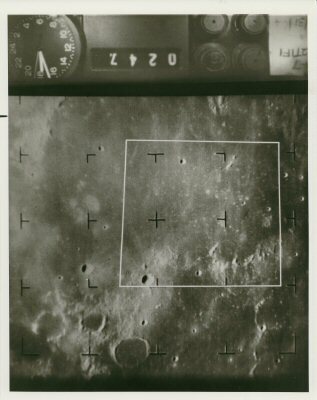 Sixty-four hours and 31 minutes later, on March 23, the photo-taking spacecraft impacted the Moon's surface 4 miles from the aiming point after a trip that covered more than 230,000 miles. The six cameras aboard returned 5,814 photos. The impact point was on the floor of the crater Alphonsus. 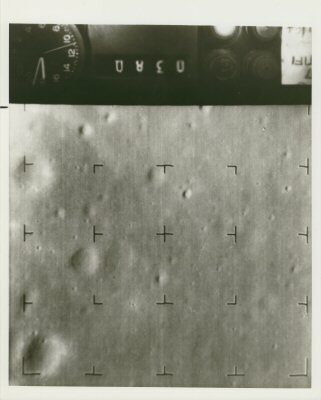 Television picture taken by Ranger IX prior to impact on 24 March 1965 at 6:08:20 PST. This was taken 2 minutes 50 seconds before impact and the spacecraft is 258 miles above the Moon. Alphonsus fills right half of the picture and Mare Nibrium is on the left. 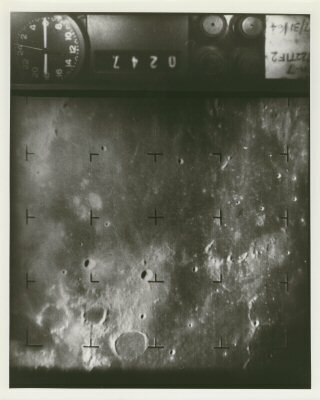 A very nice close up taken by Ranger IX just prior to impact on 24 March 1965 at 6:08:20 PST. This was taken 38.8 seconds before impact and the spacecraft is 58 miles above the Moon. A fine view of the central peak area of Alphonaus with rills running through its shadow. This was taken 8.09 seconds before impact and the spacecraft is 12.2 miles above the Moon. The large crater seen on the left is 1.6 miles across and situated on a shallow rille running upwards. This was taken 2.97 seconds before impact and the spacecraft is 4.5 miles above the Moon. Craters down to 40 feet in size can now be seen.